The Bronx is rich in assets but also in massive challenges, including persistent intergenerational poverty and some of the worst health statistics in the state and country. BCDI calls these "hopeful contradictions." These contradictions persist for the fundamental reason that Bronx residents have traditionally not been present at the table when investments are made and assets deployed in the borough. The Hunts Point Cooperative Market is a case in point. Although the market is one of the largest food distribution centers in the world—responsible for 85% of the fresh produce, meat, and fish found in the supermarkets of the greater New York region—until recently fresh produce was nowhere available to residents who live in the nearby communities. Indeed food deserts continue to exist throughout the borough. Other examples of this pattern of assets failing to serve the community abound—world class health care institutions reside in neighborhoods with some of the worst health statistics in the state and country; some of the most successful commercial corridors exist in neighborhoods with extraordinarily high levels of unemployment and poverty (often double the state average). 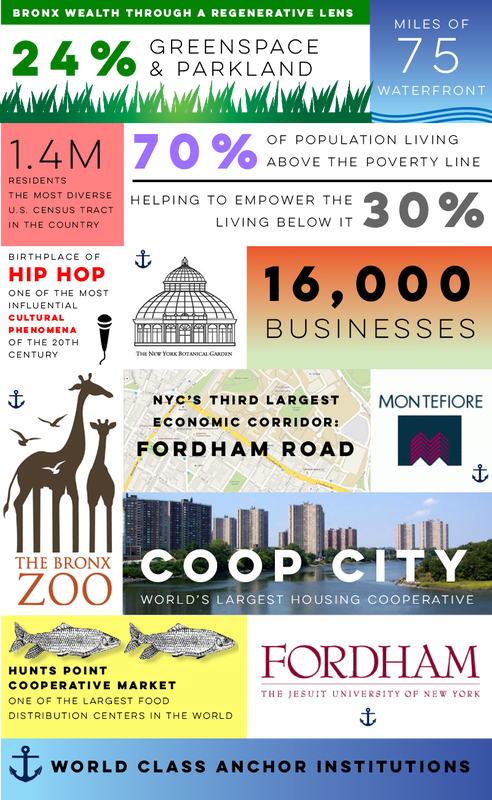 Empowering the Bronx community to regenerate itself by redeploying its abundant assets is what BCDI is about.